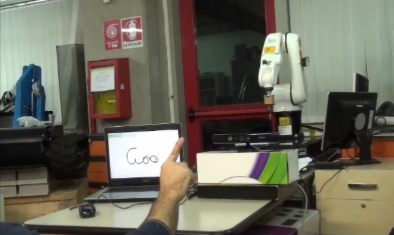 The project aim is to make a robotic arm easy to use with the kinect. This system provides a simple front end that hides the complexity in the programming of a robotic arm. It’s a system that can work with existing applications, but provides new usage scenarios. If the user lifts only a finger, any kind of events can be generated. For example , drawing or marking specific paths to be tracked can be easily done just by moving the index finger in the space. The Kinect Power! This software, based on the Microsoft Kinect, uses hand motion detection based on a clustering hand detection algorithm. 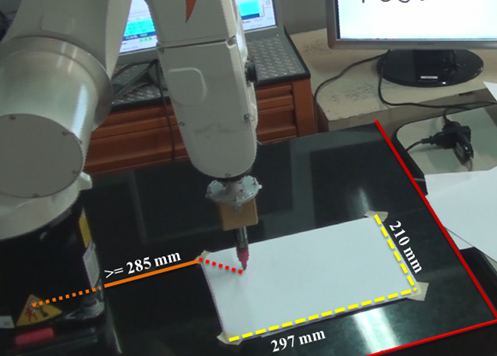 The coordinates of the hands are sent to an application that computes the inverse kinematics and the desired robot trajectory. A raised finger sends an input. With the hand closed, the cursor is displayed on the screen without transmitting touch input. Fig. 1 Working Area of Kuka. The method is used to send the coordinates when the finger is detected, then, when the hand is closed the trajectory is considered concluded. It is necessary to keep the hand closed (first) because when the user lifts a finger, the system sends an input signal (touch). Fig.2 Software C# Multithread “Kinect Writer”. To improve the quality of the trajectory, interpolation and moving average has been implemented. A system of events linked to voice commands is also integrated with multiple features. To avoid the activation of unwanted commands, the user must keep both hands closed while saying the command. All controls to be tested must have a confidence level greater than a given threshold (to be decided experimentally).